Want to make a romantic dish for your other half or simply adore pasta? 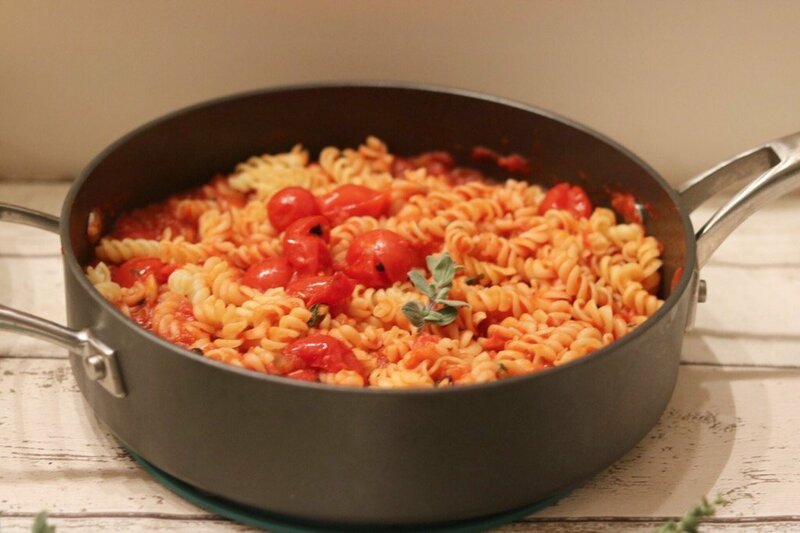 This recipe is filled with lots of tomato love and aromatic herbs and is absolutely delicious! It is so easy to cook yet such an impressive and such a hearty meal. Boil your pasta and cook for the length indicated on the packaging. In the meantime, in a saucepan, heat 2 tablespoons extra virgin olive oil on medium heat. Add the onions, garlic and peppercorns, and sautee for 5 minutes, before adding the Cirio Finely Chopped Tomatoes with Basil. Now add the salt, rosemary, thyme and oregano. Mix well and cover the pan and let this cook for around 10 minutes. Now add the Cirio Cherry Tomatoes. Add the pasta in and mix well. Garnish with a few oregano leaves. This post is in collaboration with Cirio UK, whose range of Tomato products have been much loved for Italian cooking since 1856. Even Antonio Carluccio loves them and earlier last year I had the opportunity to interview him, which you can read about and watch here. This is a wonderful recipe. I’ve made it before and I find it to be a real comfort food, wholesome, filling and satisfying. Thank you for sharing this.